Take some strength and cool close control, mix with a dash of pace and a splash of sublime finishing and you have the recipe for Augsburg's athletic Venezuelan attacker, Sergio Cordova. His jaw-dropping Goal of the Tournament at the 2017 FIFA Under-20 World Cup in South Korea contained all of the above ingredients. That he scored three more at those finals brought the 6' 2" forward an astounding level of attention from clubs hoping to tempt Caracas FC to part company with their striking star. Augsburg provided a convincing case, and Cordova agreed terms on a five-year deal with the Bavarian side. Watch: Cordova's majestic debut Bundesliga goal! "We're certain he'll deliver in the Bundesliga and we'll give him the necessary time to acclimatise and develop," FCA sporting director, Stefan Reuter, said at the Venezuelan's unveiling last July. The path taken by the South American since then has not been devoid of obstacles, but slowly, Cordova is coming into his own, gaining confidence and playing time. Perhaps most importantly of all, the player remains convinced that with patience, his immense talent will be fully realised in the Bundesliga. 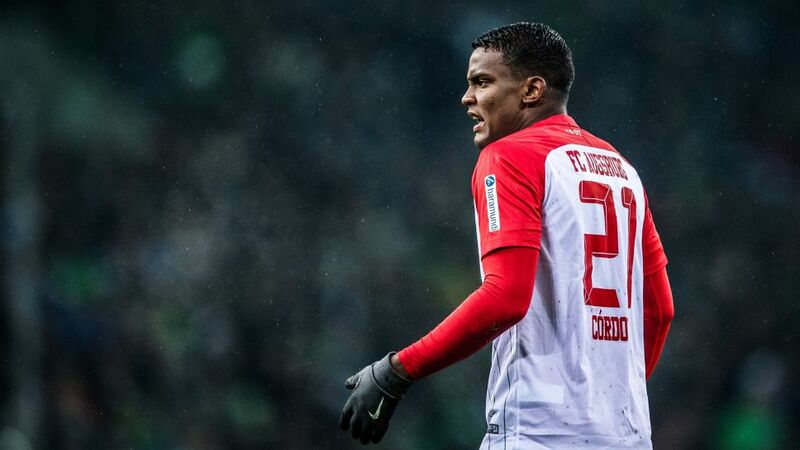 "I'm going to try to do my best, give everything I've got in every game, be it as a starter or a substitute," Cordova told bundesliga.com recently. A first start arrived on Matchday 18 when Augsburg beat Hamburg 1-0 to continue their impressive run in 2017/18. As many as eleven Bundesliga substitute appearances preceded that memorable moment for the 20-year-old, which can only have been bettered by the attacker's last-minute equaliser - a flying left-footed volley - against Borussia Mönchengladbach in this season's second round of games. In fact, things had been going so well at the start of the current campaign that Cordova won his first senior caps with Venezuela. It was to prove a bittersweet moment for the Calabozo native, who suffered a serious ankle injury while on international duty that forced him into the treatment room for two months. "Out on the pitch, I felt fantastic before getting injured," he explained. "I was called up to the senior international team and things were going well. Then what happened, happened," he continued. "I won't lie to you, [the injury] represented a difficult time for me; they were some tough weeks. But that's part of football and now I must focus on working hard once more, rising back up to reach my previous level. I'm 20 and have a long road ahead of me, but I can't afford to take it easy." What also can't have been easy for the former Caracas man was the period of adaptation to a culture and country different to his own, and at such a young age. "I feel I have grown a lot here, especially when living alone and not knowing many people," he said. "I feel more mature now. I'm good here and hope to be in Augsburg a long time. I have a contract until 2022 and I'm not thinking about anything other than being in Germany." A huge part of Augsburg's success this season has come thanks to the goals of their top scorer, Alfred Finnbogason, and the Iceland forward has made a big impression on the young Cordova, who is keen to learn as much as he can from his striking elder. "He's incredible; you just have to look at him and the way that he works and trains," Cordova said. "He's so intelligent out there on the field. He's always exactly where he should be. I admire him a lot. Every striker should follow his example." Hoping himself to become an example for others to follow, the Venezuela attacker is happy to bide his time in order to reach his best in Bavaria, with Augsburg certain to see their South American youngster blossoming soon.